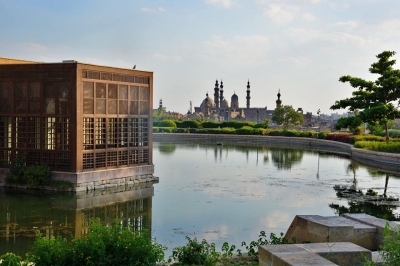 Historic Cairo encompasses the historic centre on the eastern bank of the Nile, which includes no less than 600 classified monuments dating from the 7th to 20th centuries. Among them are Islamic Cairo, overlooked by the Cairo Citadel, Coptic Cairo and its many old churches and ruins of Roman fortifications. A lot can be said about Historic Cairo and Cairo in general, but I will focus my review on the mosques of Islamic Cairo. I was in the mood for it: just before this trip I bought the book Mosques. Splendors of Islam and I recently re-visited Istanbul – famous for its exquisite Ottoman mosques - as well. 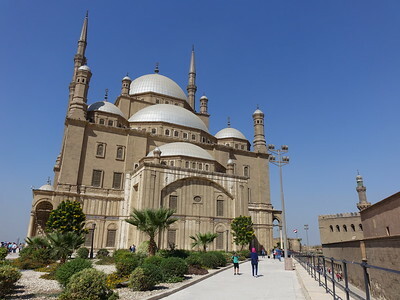 Cairo however might the best place in the world to see the architectural development of mosques: from the Samarran style to the designs favoured by the Fatimids, the Mamluks and the Ottomans. Beforehand I had made a list of mosques from the different periods that I wanted to see: Ibn Tulun Mosque (Samarran) + Al Hakim & Al Azhar Mosque (Fatimid) + Sultan Hassan & Aqsunqur Mosques (Mamluk) + Muhammad Ali Pasha (Ottoman). Due to the considerable walking distances between them, I ended up only visiting the ones that I have underlined. The first of these was the oldest: the Mosque of Ibn Tulun (879). It exemplifies the early tradition of the Arab-plan or hypostyle (“many columns”) mosque, with a spacious courtyard (“to accommodate the large number of worshippers during Friday prayers .. in the warm Middle Eastern and Mediterranean climates”) and a flat roof dominated by a single minaret. From downtown I first rode 2 stops southwards by metro to Saad Zaghloul station and then - with a map in hand – looked out for this mosque. I immediately walked in the right direction, but it still took me 20 minutes to find it. Nothing is signposted here in Cairo and the mosque is too low to stand out among the surrounding buildings (you can see it very well though from the Citadel looking down). The Ibn Tulun mosque is known for its spiral-shaped minaret, which has been designed following the example of the minaret of the Samarra Mosque in Iraq. The mosque does not look very much in use anymore: much of it is covered in pigeon droppings. At the entrance you get protective covers for your shoes - probably intended not to contaminate the holy ground with street dirt, but here also very welcome as a hygiene measure. Nevertheless, I was very impressed by its simple but strong architecture. From the 10th century on, the Fatimid Dynasty came into power in Cairo and the city started rivalling Istanbul. The change the Fatimids brought with them was the veneration of their caliph. This lead to public appearances in the form of holy processions and in mosque architecture the innovation of the mosque façade as an important backdrop for sacred rituals. The Al Azhar mosque is one of the buildings left from the Fatimid heritage in Cairo. It was still built as a hypostyle mosque: I found many students praying and reading under the shaded corridor, while the marble of the open courtyard was being polished and cleaned to perfection. I arrived during prayer time, but that did not matter: I was welcomed anywhere on the premises (after they had given me a robe to wear). This was also the most actively religious of the mosques that I entered on this day. I encountered many Muslims from other countries such as Malaysia / Indonesia and Central Asia praying and probably studying here (it is said to be the oldest still operating university in the world). In the 13th century, the Mamluks took over Cairo. They were equally ambitious builders as the Fatimids. Their innovations included the integration of charitable institutions and mausolea into their mosque designs. They are also known for their intricate stone masonry. And they replaced the hypostyle structure of the prayer hall with the Persian iwan (with 4 open spaces, 1 on each side of the courtyard). From this period I visited the Sultan Hassan mosque. This huge mosque lies at the foot of the Citadel. Its portal and courtyard, in the textbook Persian iwan style, are just beautiful. Behind the pulpit lies another room, intended for the tomb of Sultan Hassan himself (but that never happened). Here too, one gets the feeling of being in Persia. The corners of the burial room are covered with muqarnas. Finally, the Muhammad Ali Pasha mosque at the Citadel is a pure Ottoman creation. It was modelled after the Yeni Valide Mosque in Istanbul (according to wikipedia its model was the Sultan Ahmed Mosque – but I think it looks more like the Yeni, a suggested by the Mosques. Splendors of Islam book). This is the most visited mosque of Cairo and just as the rest of the Citadel a bit too touristy for my taste. There are many beautiful, really old buildings to see here in Historic Cairo: you just have to look through the mess. Cairo does not have the grandeur of Istanbul, but it has much more variety in building styles. A full day is necessary already for Islamic Cairo alone: I walked around from half past 8 to half past 4. And then you still have Coptic Cairo left which is also part of this WHS and worth half a day. When my boss told me that I have to go to Cairo for short business trip during the Ramadan, while I felt really happy to visit Egypt, I had load of questions and concerns, not only from my assignments, but I had no idea what is do and don’t during the Islam fasting month, do I have to eat breakfast before sunrise? Or can I drink water in the meeting room, etc. etc. and as a World Heritage Traveler, do I have time to visit Historic Cairo and the Pyramids! I really interested to visit old Cairo, because this city is a treasure trove of Islam architectures. With a bit of luck, I managed to have half day city tour to visit Old Cairo in the afternoon. Bad news was most of attraction will be closed early around 3 PM because of Ramadan, so instead of focus on single monument complex like the Citadel, I decided to visit the historic Al Moez Ldin Allah Al Fatimi Street or shortly Al-Muizz which according to Wikipedia this street have the greatest concentration of medieval architectural treasures in the Islamic world. I started my visit at the iconic Bab Zuwaila, the old south city gate, its thick wall and beautiful twin high towers were just great introduction of Cairo’s incredible art. With my great regret all the entrance to every attraction were already closed even before 3 PM, so I had no chance to see the interior courtyard of all those grand mosques along the street. After I reached Al Azhar Mosque, the oldest mosque of Cairo, its tall minarets were just amazing breathtaking with each constructed in different styles representing its long history. Then I walked passed the famous bazaar of Khan el-Khalili, the whole market was full with locals who came out to buy fresh products to prepare dinner. While this was not my first experience with the Islamic world’s souk or bazaar, Cairo one was pretty amazing for its size and gave me authentic locals market feeling than the one I saw in Persian countries. Then I walked back to see Qalawan Complex along the Al Muizz, a Mumluk masterpiece. The complex exterior was incredible mix of styles with Greek Roman columns and Gothic door. Its stucco minaret was just a beauty to see. Beshtak Palace area was the next significant landmark I saw; this area has many well preserved wooden lattice box windows called Mashrabiya. These beautiful wooden windows reminded me those impressive similar wooden box windows in Lima. There were so many incredible pieces of art along the street from wooden decoration door to intricated minarets. Walking along the Al Muizz was really made me understand why Cairo is World Heritage Site. Not Only architecture, with many small shops along the street gave this historical zone to be very lively with both sight and sound. I ended my walk at Bab Al-Fatuh, another city gate in the north. After that I went to beautiful landscape Al-Azhar park. From here I could see the beautiful citadel and its nearby mosque, many domes of tombs in the area that called city of death, but the most impressive one was the skyline of Old Cairo of countless minarets which made Caro earned it the nickname 'the city of a thousand minarets. Not only because of its stunning arts, I found that this Cairo visit was beyond my expectation because of the Ramadan. First, the traffic was light, I could go to everywhere I wants within less than 40 minutes even the place was located in the opposite side of this metropolis. Second, Egyptians were extremely friendly and tolerated non-fasting visitors, eating and drinking on the street was no problem. Third, the late afternoon to evening Ramadan festivities were just incredible with great food and local’s kindness. I spend only 6 hours in Old Cairo and felt that I love Cairo and want to come back to see this incredible city and those magnificent sights again. The winding streets of historic Cairo were a welcome change from the traffic congestion of downtown Cairo. When I visited in fall 2012, I spent one day visiting the Coptic section of the city and one day in the historic Islamic section. Nestled within the walls of an old Roman fortress in the southern part of Cairo are several Coptic churches, including the unique Hanging Church (suspended over a gatehouse of the fortress) and the St. Barbara Church, as well as the Greek Orthodox Church of St. George with its monastery; the enclave was quite a sight to see. The historic Islamic section of Cairo was a bit more spread out, and I started at the Citadel, with its impressive Mosque of Muhammad Ali and the older Al-Nasir Muhammad Mosque, before working my way north through narrow streets to the twin minarets of the Bab Zuweila (Zuweila Gate). 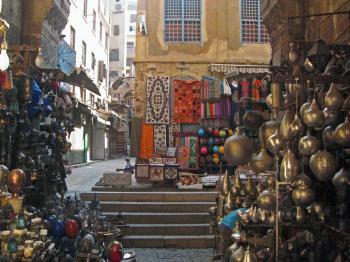 The Khan el-Khalili market was a wonder to explore, as were the surrounding neighborhoods. Although I was unsuccessful in finding the childhood home of the writer Naguib Mahfouz, I really enjoyed the variety of Islamic architecture I passed along the way. When I was in Cairo in February 2015 I visited the Historical Cairo. Both the Islamic and Coptic part. The Islamic takes a day to see all for sure, the Coptic you not need a full day. It for sure was quiet everywhere, not many tourist. I like both places. Different religions mixed in a city does work as you can see here. Everything was in good state and easy to visit. We did have a guide to keep the touts away but on general we had no problems with touts. Did not get ripped off, did not get food "problems". I can recommend really everyone to visit Cairo, also now, it's perfectly safe to go! I used a guide from Egyptian Sidekicks; they are students and do not ask for tips and extra money. All fair and perfect service! I visited this part of Cairo during my time in the US Army. It was 1998 and my fourth deployment to the Middle East. Cairo was almost overwhelming in its variety of impressions, sights, and just the sheer number of people. New Mexico, where I live, has roughly 10 people per square mile, or some other ridiculously low number. Cairo has about 170,000 (based on the figures I read). WHAT A DIFFERENCE! Having said that, the historic section of Cairo is just beautiful, even though it is showing the wear and tear of the ages. Minarets, markets, mosques, tilework, colors, smells, people...I still get dizzy thinking about it. I only wish I had done more research prior to my visit. It sometimes becomes a little difficult to determine the age of a building...which might cause you to miss something truly remarkable. I can only say "GO!" if the opportunity comes your way. I visited this WHS in March 2010. It is one of the world's oldest Islamic cities with several mosques, madrasas, hammams and fountains. The highlight of my visit was the Alabaster Mosque and its marble courtyard. The City of Cairo is an impressive place. The views from the Ancient City are simply astonished and the Mosques are very beautiful. It's possible visiting them and the Cairo people have some kind of joy that make the experience wonderful. Historic Cairo with it's medieval layout , impressive mosques, and huge traditional market is fascinating. It's quite a large area and goes to show how important cairo was in the past. The mosques were imposing and unadorned. Worth a quick look. I was still finishing some work when I - first time in my life - arrived in Cairo late one Dember evening. Following day, after having switched off the western world, I headed for the area named as “medieval Cairo”. Accompanied by the shop-keepers early morning routines of setting up their stands, filled with colourful fruits, raw meat and vegetables, I entered this “Arabian Nights”-look-a-like place through its northern gates and found myself suddenly in a world of its own filled with strange smells of spices, food, dirt and live animals. After having wondered around, visited a couple of mosques and fighting my way passed eager salesmen and beggars, I ended up in the Khan el Khalili bazaar for a touristy cup of coffee at the famous Fishawi Café. Though I could have easily bought myself dozens of carpets and other goods on my way, I continued down the Sharia El Muizz-street to the Tentmakers bazaar and later the gigantic Mamluk-mosques of Sultan Hassan & Ar-Rifai. A lunch at the Citadel ended a long promenade through a place where times seem to have stood still. It’s an almost magic place that you must not miss when visiting Cairo. Egypt is famous for its ancient history, the age of pharaohs and pyramids up to Cleopatra and the Roman Conquest. What came later, after the rule of Rome and Byzantium, is less well known in our minds, but of course no less important for Egypt today. Arabs conquered the country in the mid-7th century, and ruled for a time from Alexandria. In the 10th century, they built a new city on the banks of the Nile that they called al-Qahirah, the Victorious. Today it is the largest city of both Africa and the Arab Countries, but it doesn´t figure prominently in most peoples´ travel plans. That´s partly understandable, since the place is incredibly crowded, dirty, smoggy, and an insult to your senses in general. However, you can get used to that (really!) and the place has at least two things to offer that have to be seen by everybody - the Pyramids, which are not that far outside Cairo, and the Egyptian Museum, one of the greatest museums I have ever seen. Other sights like the Khan al-Khalili Bazaar and the Ottoman Fortress are interesting as well, but similar to other places in different Arab cities. Hotels and restaurants are usually very good, so if you can hold your breath for a while, there is no reason not to go to Cairo. My visit here was in 1995-long before the attacks of 9/11 that spooked Americans from traveling to the Middle East. Though not a Muslim myself, I was entranced by the exotic atmosphere that Cairo exuded. Perched in my hotel on an island amid the mighty Nile, it wasn't hard to picture the history that made this place what it is. From "Islamic Cairo" to "Historic Cairo"
Terrorist Attacks: "On Thursday, 7 April 2005, a suicide bomber detonated an explosive device on Sharia al-Moski in Islamic Cairo, near the al-Hussein Mosque and Khan el-Khalili, a major souq popular with tourists and Egyptians alike. Three foreign tourists (two French and one American) were killed, and 11 Egyptians and seven other overseas visitors were injured." Followed by further (lesser) attacks. Abbasid Caliphate: Ibn Tulun Mosque (870-879), the oldest surviving mosque in Egypt. Its minaret was modelled after the one in Samarra. Mamluk Sultanate: Palace of the Bashtak, Sultan Hassan Mosque (1356-1362), various mausolea. Cairo also was the capital of the Mamluks. Ottoman Empire: Part of empire from 16th century until 1867. Visible remains for example in ornamentation at the Harem Palaces at the Citadel, Ibrahim Agha Mustahfizan House-Waqf e.a. Ibn Khaldun: Lived there from 1384 until his death in 1406. Taught at al-Azhar University and was appointed a qadi or "judge" by the Egyptian Mamluk sultan. Mohammad Reza Shah Pahlavi: The Shah is buried in the Al-Rifa'i Mosque within the Cairo Citadel. He died in Cairo during his exile after being given permanent asylum there by Sadat (He had previously been "shuttled" between Morocco, Bahamas, Mexico, USA and Panama!). His family had connections with the mosque - King Fatouk his brotherin Law is buried there and his father Reza Shah had initially been buried there. Modelled after: The minaret of Ibn Tulun Mosque was modelled after the one in Samarra. Muhammad Ali Pasha mosque was modelled after the Yeni Valide Mosque in Istanbul. Name changes: Changed in 2007 from "Islamic Cairo" to "Historic Cairo"